Probably the richest library in Drupal is the jQuery UI library and this contains utilities to trigger actions when things are dragged or dropped. It contains utilities for adding new effects and a wide variety of other items. So you can take a look at the jQuery UI website if you want to get a feel for all of the different utilities you have to work with as well as see demonstrations and get example codes so you can begin implementing code that leverages these libraries. Secondly, we talked about Ajax forms in a previous video but I just wanted to reiterate here that you can use the Ajax Drupal library in order to create dynamic forms that will grab data from the server and replenish certain sections of the form in order to create a very seamless user experience if a user needs to add additional items to a form. For example, they are filling out a form to register a family and they need to add new inputs for new family members. We have also demonstrated in the forms section how to use autocomplete in text inputs in order to allow the user to type in a few letters and then have that create a dropdown of options that they can either click or use the arrow keys to navigate to and click enter in order to prefill that element, and that can be really useful when using a search or adding in something like a username for a form. 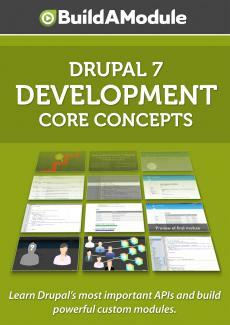 You see in several places in Drupal where there are drag and drop ordering mechanisms. For example, in the blocks or in the fields utility, you can drag an item from one section to another and have it automatically bump the other ones down. This is really useful and you can use this utility in your own module as well if you have a good use case for it.